AUCTION TERMS & CONDITIONS PICKETT AUCTION SERVICE LLC LOCATION: 20550 N Whittier, Greenleaf ID. From I-84 exit 27 go south on Centennial then west on Simplot Blvd (Hwy 19) 4 miles into Greenleaf, north on Whittier, signs posted. SOME ITEMS WILL NOT BE LOCATED ON SITE. Those locations will be noted in the item description. *** FOR AUCTION SPECIFIC DETAILS: Buyers premium, payment dates, credit card policies, preview & loadout dates and times. ~ Please read Information Lots 1-15. *** PAYMENT: YOU WILL RECEIVE AN INVOICE BY EMAIL. Your credit card IS NOT automatically charged. Cash, Visa, M/C, Discover, & Debit Card. (3% fee on all cards) Check or Check by Phone. Wire Transfer (fees may apply). **WE NO LONGER ACCEPT AMERICAN EXPRESS** Invoices will be emailed to all winning bidders within 2 hours of the completion of the auction. **IF YOU DO NOT RECIEVE AN INVOICE ~ CALL OUR OFFICE AT 208-455-1419** Invoices unsettled after the due date will be charged to credit card at registration. There is an additional 3% fee for payment by credit/debit card. Your invoice total will not reflect the additional 3% if paying by credit/debit card. This amount is to be added at time of payment. 10% Buyer's premium will be charged up to a maximum premium of $500 per item. Registration: All buyers will register to bid through the website. Bidders will establish a user name and password. A credit card authorization will be required at time of registration. The credit card will not be used for payment, an invoice will be emailed to successful buyers at the close of auction and payments will be accepted under the terms of payment. Please be sure that you have SUCCESSFULLY completed the credit card authorization prior to bidding. If you wait until the last minute to perform this operation you may be late to bid on your desired lots. SHIPPING & FIREARMS NOTICE: **SPECIAL CONSIDERATION IF YOU ARE PLANNING TO SHIP. WE WILL USE A LOCAL FIREARMS DEALER. BIDDER WILL BE RESPONSIBLE FOR FEES OF HANDLING, SHIPPING & INSURANCE. NO EXCEPTIONS. PLEASE NOTE BEFORE BIDDING, WE DO NOT SHIP AMMUNITION. FOR MORE INFORMATION BEFORE YOU BID PLEASE CONTACT OUR OFFICE. 208-455-1419 NEW NOTICE: After 14 days from the auction closing PICKETT AUCTION SERVICE WILL CHARGE a lot storage fee of $25 dollars a day until you are able to pick up your item(s). Storage fees are due at the time you pick up. If you have trouble making the load out time please call us to make arrangements. If items are not picked up during scheduled load out time or arrangements have not been made by the buyer the items will be considered abandoned and will be removed by Pickett Auction Service at the buyer's expense. Please if you cannot adhere to this requirement please do not bid!!!! NO ITEMS WILL BE REMOVED UNTIL SETTLED FOR IN FULL. Announcement: All descriptions are believed to be accurate. However, no liability for accuracy, measurements, errors, or omissions is assumed by the sell, closing agent nor Auctioneer. The buyer is responsible for verifying all information and condition of items. All items are sold as is where is, with no warranties or guarantees of any kind! BE SURE TO PREVIEW THE AUCTION or call with questions. Fraudulent bidders / Unpaid invoices: By bidding on items, you are entering a legal and binding contract. Pickett Auction Service LLC. reserves the right, and you acknowledge and agree to its exercise of this right, to notify third parties, including law enforcement authorities, credit bureaus, other auction companies and industry regulators and authorities, about bidders involved with or connected to fraudulent bidding or the failure to fully pay invoices in accordance with our terms and conditions. 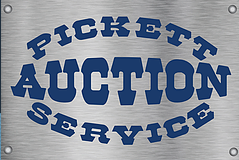 For any unpaid invoice Pickett Auction Service WILL turn all uncollected amounts over to a collection agency for collection OR other solution deemed necessary by Pickett Auction Service. Note: By accepting the terms and conditions of this auction you are entering into a binding contract and if you are the highest bidder on any item you will be required to pay for the items in accordance to the terms set forth in the terms and conditions of sale. 1) INTERNET ONLY AUCTION TERMS AND CONDITIONS: All items sold "as is where is" with any faults. ALL DESCRIPTIONS ARE BELEIVED TO BE CORRECT, THE AUCTIONEERS OR THE OWNER MAKE NO WARRANTIES OR GUARANTEES EXPRESSED OR IMPLIED, as to the authenticity of or defect in any lot and will not be held responsible for any advertising errors, discrepancies or inaccuracies. All Buyers are to be responsible for any and all inspections of items at preview times or inspection by appointment. VEHICLE CONDITION & MOTORIZED CONDITIONS ALL ITEMS SOLD "AS IS " CONDITION. MOST ITEMS ARE PRE-OWNED AND THERE IS NO WARRANTY OR GUARANTEE FROM PICKETT AUCTION SERVICE. WE WILL MAKE NOTE OF OBVIOUS CONDITION. THESE ITEMS DO NOT GO THRU A CHECK SYSTEM WHEN ENTERED INTO THE AUCTION. EVERY BIDDER IS ENCOURAGED TO PREVIEW AND YOU MAY BRING ALONG YOUR OWN MECHANIC. ALL SALES ARE FINAL SO PLEASE INVESTIGATE PRIOR TO BIDDING. 2) PAYMENT: COMPLETE PAYMENT FOR ALL ITEMS PURCHASED ARE DUE AS POSTED BY THE AUCTION COMPANY. An invoice of your items purchased will be emailed to you within 2 hours of the close of the entire auction. IF YOU DO NOT RECEIVE AN INVOICE PLEASE CALL OUR OFFICE 208-455-1419 PAYMENT METHOD: Cash, Visa, Master Card & Discover, wire transfer, or Check by phone to Pickett Auction Service. There is an additional 3% fee for payment by credit/debit card to be added at time of payment. NSF CHECK FEE OF $35 WILL BE CHARGED AND BIDDING Privileges SUSPENDED. INVOICES UNSETTLED: will charge to credit card on registration. 3) A 10% (Ten percent) Buyers premium will be added to Purchases up to a maximum premium of $500 per item. 4) Applicable Idaho Sales Tax of 6% will apply to purchases. Dealers purchasing for resale must submit resale permit number with Pickett Auction Service. ST101 provided at our office. 5) TITLES: IF PAYMENT IS MADE ON TITLED VEHICLES WITH CASH, OR CREDIT CARD OR CASHIER CHECK ALL AVAILABLE PAPERWORK WILL BE GIVEN AT TIME OF PICK UP. IF PAID BY CHECK PAPERWORK WILL GO TO BIDDER VIA CERTIFIED MAIL. 6) REMOVAL: All items must be removed within the allotted time frame set forth by the Pickett Auction Service for each auction. Time frames will be strictly adhered to; if you are unable to pick up your purchased items or make arrangements for your purchased to be picked up in the time frame set forth please do not bid on the items. Shipping arrangements can be made by the Buyer at the Buyer's expense. Buyer assumes solely all expenses, risks and liabilities for removal of purchased items. If purchased lots are not removed in the allotted time frame the Buyer shall be liable for any moving and storage costs incurred, and if not removed, the items will be deemed abandoned. Buyers assume all risk associated with the removal of items from auction site. 7) ITEMS LEFT ON THE AUCTION LOT OVER 21 DAYS WILL BECOME PROPERTY OF PICKETT AUCTION SERVICE OR A LOT HOLDING FEE WILL BE CHARGED. ANY DEPOSIT OR PARTIAL PAYMENT WILL NOT BE REFUNDED TO THE CONTRACTED BIDDER. PLEASE DO NOT PLAN ON LEAVING YOUR AUCTION ITEM OVER 7 DAYS WITHOUT PRIOR PERMISSION. UNPAID FOR ITEMS WILL BE HANDLED AT THE DISCRETION OF THE AUCTION SERVICE. 8) By registering as a buyer and being able to place bids on lots in this auction you agree that you have read and agree to the terms and conditions set for this auction.